When a couple plans for a child today, every moment seems precious and unique. Home pregnancy tests promise good news just days after conception, and prospective parents can track the progress of their pregnancy day by day with pregnancy apps that deliver a stream of embryonic portraits. On-line due date calculators trigger a direct-marketing barrage of baby-name lists and diaper coupons. Ultrasounds as early as eight weeks offer a first photo for the baby book. Yet all too often, even the best-strategized childbearing plans go awry. About twenty percent of confirmed pregnancies miscarry, mostly in the first months of gestation. Statistically, early pregnancy losses are a normal part of childbearing for healthy women. Drawing on sources ranging from advice books and corporate marketing plans to diary entries and blog posts, Lara Freidenfelds offers a deep perspective on how this common and natural phenomenon has been experienced. As she shows, historically, miscarriages were generally taken in stride so long as a woman eventually had the children she desired. This has changed in recent decades, and an early pregnancy loss is often heartbreaking and can be as devastating to couples as losing a child. Freidenfelds traces how innovations in scientific medicine, consumer culture, cultural attitudes toward women and families, and fundamental convictions about human agency have reshaped the childbearing landscape. While the benefits of an increased emphasis on parental affection, careful pregnancy planning, attentive medical care, and specialized baby gear are real, they also have created unrealistic, and potentially damaging, expectations about a couple’s ability to control reproduction and achieve a perfect experience. 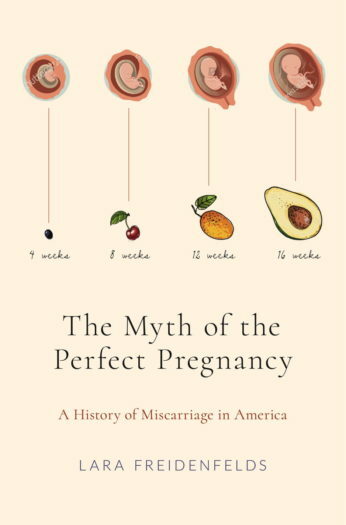 Freidenfelds suggests that history offers ways for miscarriage to be more effectively acknowledged and experienced, and The Myth of the Perfect Pregnancy provides a reassuring perspective on early pregnancy loss. She proposes ways in which the marketing of pregnancy and the surrounding technologies can be improved with the experience of pregnancy loss in mind, and she suggests ways for miscarriage to more effectively be acknowledged by women, their families, and their healthcare providers.